Even as Yahoo (s yhoo) was closing in on its ambitious $1-billion acquisition of Tumblr last week, the web giant was busy on a number of other fronts as well — including a relaunch of its classic photo-sharing service Flickr. But just as some sceptics (including us) have raised red flags about Yahoo’s ability to capitalize on the purchase of Tumblr without ruining it, the Flickr redesign has plenty of vocal critics as well. Are these the usual die-hard users who are simply resistant to change of any kind, or has Yahoo altered Flickr to the point where it has made the service worse rather than better? As my colleague Laura Owen has described, the new Flickr includes a number of fairly dramatic changes — not the least of which is a full terabyte of storage for all users. Now, instead of a Pro level where members paid for extra storage, Flickr users can pay a monthly charge to have advertising removed from their feed, or they can pay an even larger annual fee to double the amount of space. The user interface of the service has also been completely redesigned to focus on showing large-format photos. A blogger by the name Newton Gimmick, however, argues in a post at Infinite Hollywood that the backlash to Flickr’s relaunch is more than just the typical knee-jerk response: in his view, the redesign has fundamentally changed some aspects of the service in important ways — ways that make it less likely Flickr will succeed or thrive, rather than more likely. In an attempt to be “cool” or compete with other services like Instagram (s fb), he says, Yahoo has ruined what made Flickr different, which was the element of shared community. Gimmick argues that because the new layout is aimed at creating an Instagram or Tumblr-style stream of large-format photos, many of the other features that Flickr users relied on to connect with fellow photography enthusiasts and exchange information about their photos are either missing or almost impossibly hard to find. For example, he says, Flickr used to make the “EXIF” data about a photo — the type of camera, aperture size, frame rate, etc. — obvious, but now users have to hunt for it. the more I use the new Flickr – the more I hate it. For people browsing pictures its an improvement – for people using it, its total crap. 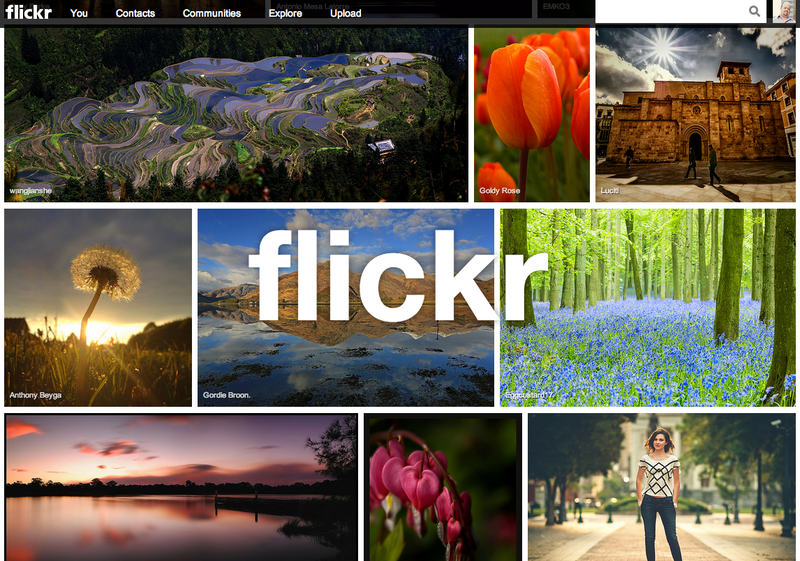 Has Flickr lost its core value? Yahoo’s CEO set off a minor firestorm following the Flickr relaunch when she said that “there’s no such thing as professional photographers any more,” which many took as a denigration of the industry. Mayer quickly explained that her comments were intended to refer just to the abolishing of the “Pro” tier of Flickr service. But Gimmick argues that the real impact of her comment is to make it clear that Yahoo no longer cares about even hobby photographers: instead, it simply wants to accumulate as many photos as possible. It’s easy to see Gimmick’s rant as just another lament for the passing of the “good old days” by someone who has been a fan of a service for a long time. But as a long-time Flickr user, I think he might be on to something with his criticisms: I have used the site mostly as a way to backup my photos — but there are plenty of places that make it easy to do that. The real killer feature of Flickr has always been the community aspects, and the redesign diminishes or hides those in many ways. That may be the kind of tradeoff that Yahoo and Mayer see as worthwhile — perhaps even necessary. But for me and Gimmick, and potentially other users as well, downplaying those features removes the main rationale for our loyalty to the site. If Flickr looks and feels just like every other photo-stream or sharing service, why wouldn’t we just go and use one of those instead? i have an 8 core processor running at 4.4 gig but cant get to the bottom of a page without my pc grinding to a stuttering mess of slowness. top that with the forced use of tracking cookies , flickr is now heading for a slow death. Critics also wonder if anyone proof-reads their copy anymore. Yahoo is going to try to make money on the backs of the photographers that upload to the site, but they fail to see that the quality level is about to drop off… because the REAL photographers, hobbiest or otherwise are going to leave…. leaving nothing but crap behind, that no one really wants to look at. Without the content, Flickr is nothing. Thomas Hawk is the only person I have heard make a possitive comment about the format changes. For him to call the criticism a small group of viscious haters is just insulting. Most of the criticism I have read has been respectful and constructive. Some spin..negative responses have been overwhelming while I haven’t personally read one positive comment about it in any of my contact’s postings or from outside Flickr.. It has ruined it, quite simply! Flickr was once a great place to post pictures and tell stories about the image-the event- location or what is “behind the scenes…” Check out remarkable photos by a photographer name Noel Kerns… his images are painstaking to set up and breathtaking… But with the New Flickr, millions of worthless and unimaginative images will be dumped into Flickr and it will become a wasteland. The social aspect that Flickr once offered will be gone too as people were able to connect easily with others who shared like interests. I recently dumped Flickr and went to Ipernity… and will be sharing my images and stories there in the future. New flickr is a major improvement. People don’t need a basic admin panel craigslist site anymore. What was useful years ago, is now just a basic function that can be replicated anywhere. Previewing and navigating old flickr was my second least favorite UX (I find ebay to be completely unusable). People always complain when things change, but I’ve already found myself enjoying the ability to find more on the site. professional artists and photographers have been left with no other choice but to move away from FLICKR! It’s a good refresh. Like many other photog enthusiasts it was becoming tiresome to be told to repost to twitter, instagram or facebook because the ppl you wanted to view your pictures thought that the display was archaic. Now, all I think Yahoo need to do is to rethink what Pro means and how those users can get the info they need. For enthusiasts teaching themselves how to take better pictures the community aspects were key – but those users need to remember that flickr was also a gallery and if ppl didn’t like to come to visit then it risked becoming a place where only photogs met other photogs. There is plenty of “old times were better” here, and it’s sad but expected. Especially considering Flickr was the equivalent of stone tablets with hieroglyphs, if measured in “web time”. However, the point made above about a “presentation” or “admin” interface is very valid. That is two different use cases but with some overlap. They admin reasonably well done (although, I think they could have done it better, it was too much clicking around). But presentation, is very important no matter you are a viewer or photographer and I cannot see how people prefer watching small thumbnails and then click 2 times for larger size is better than seeing them large(-ish) right away. I just hope they can tweak the update to make sure admininstration is still easy (caption info, EXIF), and allow some customization for the presentation, but overall, this is a great improvement. Thomas Hawk – Flick shill? Are real stats even possible for large corporate website owners? How do you Make $ from flickr Mr Hawk Really! 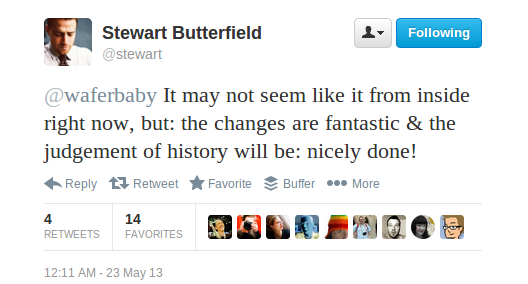 Yahoo/Flickr Changes: Good for 500px (pro/prosumer), not so good a lot for Instagram (consumer/phone). I think Flickr wants to become the next ‘Photodump’ for teenagers. The ‘New Flickr’ makes my brain melt! Thank you for this article. You will notice that most of the technology press does not even understand what Flickr was, so they are not mentally capable of accurately reporting a news article about it. But this story will probably get bigger in time. Tens of thousands of people whose careers are affected negatively? Not good. Also, commenter who said 2800 comments, that is a typo. There are over 28,000 comments, and I think now it has passed the 30,000 mark. But the joke is “1 terabyte” is only impressive to old people. “vicious haters”, thats a bit of a dramatic claim Mr Hawk, No doubt you have something to back up your words other than your seemingly worthless opinion ? I’m a run of the mill Flickr user who is busy along with many others removing my images from the greedy grasp of yahoos advertising partners, their removal of critical features and the doubling of the cost of the service not to see advertising on ones own stream is pretty much a shot in the foot, whilst many will stay and thats their choice, as a paying customer I dont comprehend why they think they can sell access to my images whilst delivering none of that revenue to me, parasites anyone ? Spot-on Mathew … Flickr thinks of itself as a photo viewing site. Flickr’s most active users use it as a social network. The redesign strengthens the viewing aspect at the expense of the networking. Flickr will lose its most active users – and the ones who posted the most interesting pictures. But then again, Flickr may indeed not care at all. ps: of course engagement is way up. For now, because of all the turmoil. And notably for the folks that are vocal in the discussions. I predict it will subside. The new Flickr features pages where the images are so huge and crammed together, it takes forever for a page to load. It is now on infinite scroll, so that slows it down even more. You cannot see comments on your photos at a glance like you used to and the staff don’t give a hang that we paid for a certain user interface, because they completely changed what we thought we were buying overnight. at 93 million users, millions will love it, millions will hate it, and the haters are more vocal. it’s certainly not gonna die. yahoo is now in the hands of an actual genius engineer, nothing like its fraudulent predecessors, and all its properties wil thrive. Much of the criticism is being rallied by a small group of vicious haters in the help forum who shout down and attack anyone who expresses a positive opinion of the changes. Personally speaking I love the changes. I hated paging before. Now I can see so many photos so much faster. This allows me to consume more Flickr and interact and engage more with photos that I like. I especially like the sets page which now shows larger photos instead of super tiny little thumbnails. I think in the longer-term, this new design will grow on people. The site may lose a few haters to change, they always will no matter what they change, but they will also add many times that with an interface that focuses so much more on the photographs themselves. As far as community goes, I think the majority of community on Flickr has taken place in Groups. As far as Groups go, nothing changed there actually. That was one area of the site that actually was *not* changed in the redesign. Personally speaking, I think that the best improvement for community on Flickr would be for staff to give us a block feature that actually worked in public areas like groups and forums. This is what Google+ did which made the site much friendlier and more polite. You seem to be trying to sneakily dismiss anyone who has a legitimate gripe about the changes as just a few rotten souls. I am appalled by the changes because my photostream used to be a place where I could display my pictures, complete with a caption. The perfect marriage: photo plus caption. For my purposes, that is how I wanted my work to be displayed. While I can still get the photo + caption mode in “edit” view, only I as the owner of my account can see it that way. No one else can. If Flickr can’t let me have that small element of control that allows photos to be displayed with captions without having to mouse over every photo just to see it, then Flickr now offers me nothing. Imagine a news site where it’s just a bunch of images, and, to actually find out what the story is about, one has to hover over the picture. It’s big and bold, but not intuitive. I don’t want my photos displayed in a manner that mimics google image search, set against a backdrop of little avatar + big background that mimics facebook or twitter or google plus. It’s boring and unoriginal. Yawn. Your keyword, “Consume”. And that’s what the redesign reflects. Faceless, gorging, crass consumption. Demographic pandering and design-by-committee, desperate hipsterism, It’d be be a fairly poor show on a free-site; on a service that people have paid for it’s scandalous and pretty fraudulent. Would you pay for a blue car that someone painted red in the night and go “WHOOO! Yeah!”? Your characterization that “…the criticism is being rallied by a small group of vicious haters […] who shout down and attack anyone who expresses a positive opinion of the changes” is completely and totally fallacious. You also characterize any negative feedback as coming exclusively from those who simply cannot abide by any change. You love to call everyone who doesn’t agree with you a “hater”; sorry, but I think that makes you a bully. The problem for me is that Flickr has just re-skinned a part of the site and reduced some of its functionality by forcing users to view almost all photo pages in the bandwith hogging justified continuous scroll they’ve chosen. Where information used to be presented alongside the pictures it now has to be scrolled down, clicked for or seen with the use of a mouseover. There’s been no upgrade of the Orangizer or any addtional features. All Flickr have done to the site is changed the way photographs are presented to users with no choice to change it. They’ve given all the free accounts 1TB but Pro users always had unlimited storage. As a Pro user who’s been on the site since 2008 and got over 4000 pictures online the Terabyte means nothing as I’ve always had unlimited storage. All that Flickr has done is changed the user interface and site style without warning and it’s buggy interface at that. They’ve dropped the change on users with no warning and with no help files to enable users to find their way round the new interface. In terms of usability, change management and PR it’s been a high dive into a bucket of the brown stuff. the new flickr experience is one for hipsters with smartphones – not photographers. for those who have a real interest in photography, rather than snapping strangers scratching their bum in public, then flickr is no longer for you i’m afraid. for flickr, now read instragram 2. I’m on Flickr since 2007 and in my view changes improve photos presentation while leaving community activity basically untouched . And clicking on edit brings back the old interface , just without sets . Uploading photos is now dramatically faster . The Android app looks sweet now . I guess data on site traffic will soon confirm this impression . Google should open up a site to mimic/replace the old Flickr and grab the user population away from Yahoo! That is what I’ve been saying – the redesign was aimed at making the viewer’s experience more interesting, but the idea that flickr was set up for PEOPLE WHO TAKE photograhs (whether they describe themselves as photographers or not is irrelevant!) and want to be able to have some control about a range of things and therefore prefer an ‘administrator’ type of layout where things can be identified easily and reliably. It is interesting in this day and age of ‘superior technological advances’ that something as basic as offering a choice of background colour, layout, etc… seems to be beyond the capability of flickr…. Yahoo is trying to compete with rivals by becoming like the rivals, weird…. I would have thought these multi millionaire CEOs would have completed ‘branding 101’ – what makes you stand out is what makes you different, better, faster… not just because you’ve got more money and you can buy more and more companies. I hate new Flickr. It’s stupid. I want old Flickr back. The old Flickr was great now it’s been ruined. It’s sad really.